The rectangular shape of Emerald cut diamond makes these pendants appear larger and upgrades any outfit to look more sophisticated and elegant. Emerald cut diamonds are an elegant and unique cut that give off more fire and radiance than some other cuts. This makes it a great birthday gift or mothers’ day gift as well. CaratsDirect2U has a large collection of up to one and a half carat Emerald cut diamond pendants, ranging from D- I Color and VVS1-SI3 clarity as well as sizes. We also sell KM processed Emerald cut diamonds. 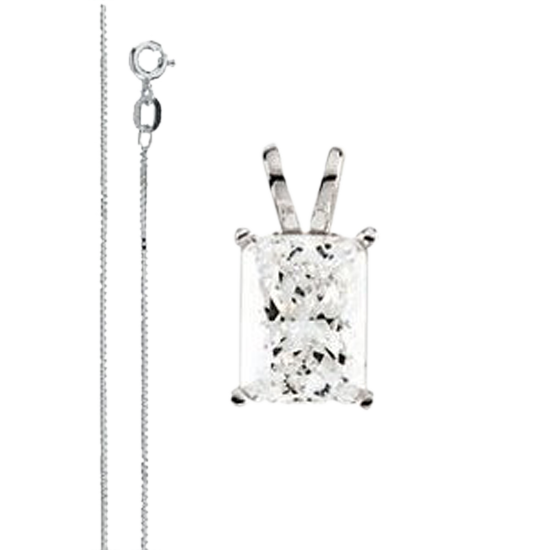 Our Emerald cut pendants all come in a four prong setting in 14k white gold. The chain for our Emerald diamond cut pendants come in a range of sizes such at 16, 18, and 20 inches in length. Our diamond certificates come from leading labs such as GIA EGL USA, IGL, WGI, and more.